(Nanowerk News) The objective of a new research proposal ("N13A-T004 TITLE: Track Markings: Artificial Pheromones for Robotic Swarms") is to develop chemical marking techniques (artificial pheromone) for information transmittal for a robotic swarm performing cooperative tasking in a fixed formation. 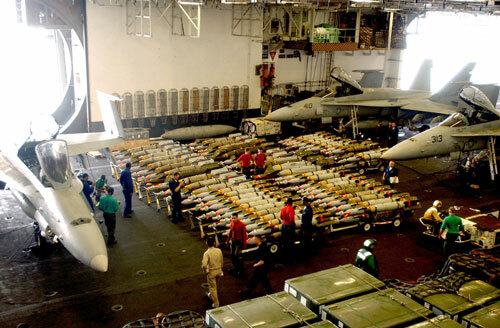 Various weapons line the hangar bay aboard the aircraft carrier USS Kitty Hawk. Weapons strike-up from the magazines to the flight deck aboard aircraft carriers is a manpower intensive process, employing 70 to 80 billets. Weapons are pushed on non-powered skids into elevators, through transfer points on the hangar deck or mess deck, and into the "bomb farm" on the flight deck staging area before the final push to the aircraft, with the entire process requiring the manpower of 3 to 6 sailors per skid. A leader-follower concept is envisioned for semi-autonomous movement of weapons that still retains man-in-the-loop control of the leader skid with unmanned followers. An enabling technology for this leader-follower concept is the idea of an artificial pheromone marking that the leader vehicle deploys as navigation and other instructions markings for the follower vehicles. This would provide a simple, accurate, and elegant alternative to more costly sensors and obstacle avoidance algorithms. Using this concept the leading robotic vehicle would deposit chemical markings, and which would transmit pertinent messages used by the swarm to maintain swarm formation and perform other control instructions encoded in these markings. These markings should transmit messages on a minimum of 3 chemical channels of the artificial robotic pheromone with 1 message per channel allowing a minimum of 3 messages in one application. Messages to be encoded: (1) swarm association, (2) speed, (3) direction. The follower swarm should be able to detect the messages and decode them. The markings should be stable during direct contact with petroleum products prevalent on the Navy ships. This chemical should also be stable on very hot surfaces (up to 200 degrees Fahrenheit) and should function on non-skid. Because there may be several materiel carrying caravans with different tasks traversing the same hallway, the developed markings must be temporary and should completely fade away within a 20 minute interval. This will prevent the leading robot's instructions from disrupting other swarms. Moreover, the AP should be functional with high wind-over-the-deck. The chemical should not pose health hazards to Navy personnel and should be environmentally safe. The amount of chemical messaging should be sufficient for a minimum of 12 hours of continuous operation. The marking material should store well for the duration of a minimum of 6 months in storage. The module should be easily installed and easily removed from a robot (member of a swarm) when required. In addition to the leading robot AP deployment mechanism it is necessary to develop chemical marking sensing techniques and equipment for the follower robotic swarm. The follower swarm must be able to decode the instructions for their execution of the path that was traversed previously by leading vehicle controlled by a human. This solicitaion opens on February 25, 2013 and closes on March 27, 2013 6:00am EST.